The described shunting practice within the concentration camp Mittelbau-Dora complex clearly shows that the working capacity during the final phase of the Nazi regime, that the decisive criterion was whether a prisoner survived or not. This is sometimes labelled as an economization of inmate labour in search for a development that led to a certain permeability of the set of rigid SS boundary lines within the inmate society. They were marked by Nationality of camp inmates and a racial hierarchy according to the criteria of their admission category. For example, a Russian skilled worker, employed in the missile assembly in the central plant, had more hope of survival than a French prisoner classified as labourer (Hilfsarbeiter) who according to national socialistic ideologue was far superior than a Russian fellow prisoner, (he, the Frenchman) may in fact sent to his eventual death, once assigned to the Building Commando at camp Ellrich, after all he was only considered as unskilled labourer. Forced labour in the armaments industry had the consequence that the concentration camp system with its external camps (Aussenlager) since the second half of the war grew more and more into German (and European) society. But in other respects, there was the proliferation of concentration camps itself: not only in the field of recruitment of the guards which was constantly expanded, but also the circle of those who were threatened by Internment [Listening to the BBC if caught or reported meant four years KZ. HKS]. 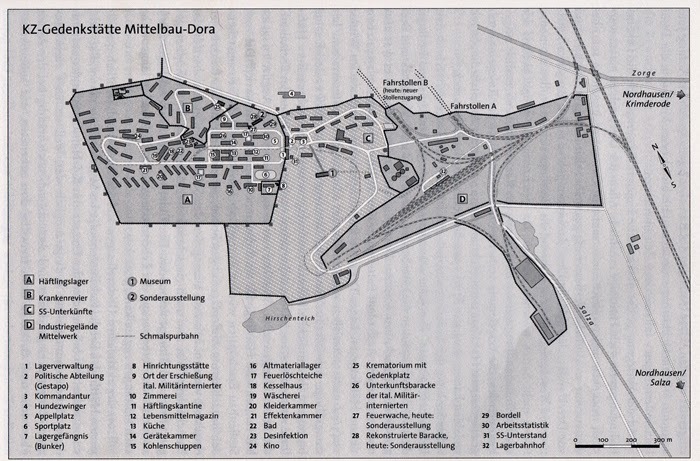 The admission categories and personal records were continuously expanded in Mittelbau-Dora, there were groups of prisoners who were not known from former concentration camps. One of these new detention categories was the 'WIFO-prisoner'. These were around 90 mainly Polish and French former civilian workers of the 'Economic Research Association', who had been used since the war began on excavation of the tunnel system in Kohnstein and were admitted in the fall of 1943 into the Dora camp. Other new groups of prisoners were about 600 Italian military internees (IMI's), most of which were admitted in the fall of 1943 and the so-called 'Zwischenhäftinge' (They had no precise definition) . These were around 750 Wehrmacht soldiers, who were transferred to the concentration camp Mittelbau-Dora for desertion or other misconducts, sentenced by the military courts in the winter 1944/45, and transferred from Buchenwald. Foundation of the block for Italian military internees'. In contrast to all other KZ Installations, Mittelbau Concentration Camp was not regarded as an Direct Admission Camp even after its independence. This meant that very few prisoners were sent after October 28, 1944, in a direct way there for internment. Instead, transports continuously arrived from other concentration camps in the southern Harz, (the Harz is a mountain range in Thüringen) most of them still from Buchenwald. Among the few prisoners who came directly into the camp , included, in addition to about 80 foreign civilian workers who were detained by local Gestapo for breaches of working contracts and other alleged offences as protective prisoners into Mittelbau, there were nearly 200 police detainees - mostly French, Polish or Russian civilian forced labourers, who were admitted under the charge of loafing (Arbeitsbummelei) or other offences and normally were kept for a period of four to eight weeks and released after the expiry of this period, if the Administration did not change the internment into Protective Custody , as the permanent transfer was called in the daily reports of the camp Gestapo. Overall, prisoners classified as new admission were only a small minority. The largest foreign share presented in the fall of 1944, were, with almost a third of prisoners from the Soviet Union, among whom were prisoners of war. Also well represented were about one quarter Polish and French, who accounted for almost 15 percent of the camp workforce. The latter came mainly in the first few months and once again increasingly after the Allied invasion of Normandy into the Mittelbau-Dora camp. As the prisons and camps in France were vacated by the retreating German occupation administration and at the same time its occupants were deported into concentration camps in the Reich. It was the same with the Polish prisoners, when transports from Buchenwald arrived at Mittelbau-Dora after the suppression of the Warsaw uprising, it reached a first numerical peak in August 1944. After the arrival of the evacuation transports from Auschwitz and Gross-Rosen, in January and February 1945 prisoners transferred from Poland became the largest share of the camp inmates. 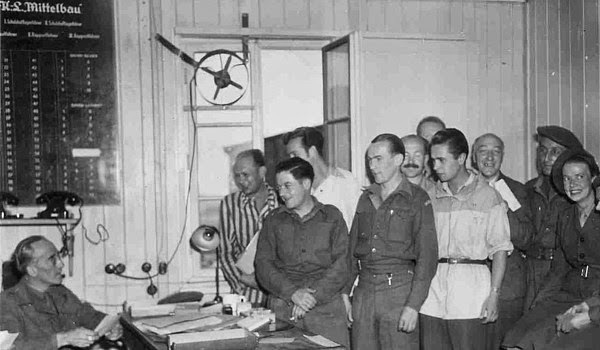 German prisoners, most of them classified as criminals, but also several hundred political prisoners, as well as homosexuals, presented in this phase of the history of the camp as to numbers an insignificant group of prisoners. However, because of their language skills and the racial hierarchy of the inmate population as set by the SS, they were the preferred appointed prisoner functionaries. All important posts in the system of prisoner functionaries were occupied in the Mittelbau camps with Germans. The aforementioned prisoners from the Soviet Union, Poland, France and Germany, these were invariably non-Jewish prisoners. Initially, there were no Jewish prisoners in Mittelbau, but this changed in late May 1944, when 1,000 Hungarian Jews arrived in the camp Dora, including many children and adolescents. Most of them were immediately forwarded to the construction camp Ellrich-Juliushütte where many died an agonizing death as a result of the murderous working conditions. At the end of September 1944 came the next transport of Jewish prisoners into the camp, these were 300 Hungarian Jews, who as a skilled workers had to work in the V-weapons production for the Volkswagen plant in Schönebeck on the Elbe, in France, on the Moselle, at camp Rebstock. In Dora the line of work this meant a closed set as forced labourers for the V-1 production. Overall the Jews remained , despite these two transports up to January 1945 into the Mittelbau-camps in the absolute minority. In most camps there were no Jewish inmates. That changed in January 1945, when in the course of the evacuation in the east located forced Labour- and Concentration Camps, several thousand Jews were sent to the concentration camp Mittelbau. Alone from Czestochowa over 1,000 prisoners (most of the prisoners of this transport arrived into the camp Rottleberode and Stempeda, where many were killed by SS personnel and Kapos or died of the effects of forced labour in the tunnels of the project B 4). In camp Harzungen the percentage of Jewish prisoners rose up early in April 1945 to just under ten percent, and that, although the mortality rate reached among the evacuees from Auschwitz and Gross-Rosen proportions that exceeded the early phase of the Dora camp itself. Most of the completely exhausted prisoners from Auschwitz and Gross-Rosen, the SS had to take into the Boelke Barracks. It can therefore be assumed that in this camp, the percentage of Jewish prisoners was still much higher than in Harzungen. Harzungen and Ellrich-Juliushütte were also the camps with the relatively highest proportion of Roma and Sinti who like their Jewish fellow prisoners inside the Mittelbau complex preferred by the SS, were similarly assigned to the two infamous construction camps. The first large transports with Roma and Sinti (a total of about 800 inmates) arrived in mid-April 1944, and the middle of May 1944 , from Auschwitz via Buchenwald into the two camps . Several hundreds more Roma and Sinti, the SS deported in August 1944 after the dissolution of the family camp in Auschwitz-Birkenau and the murder of most of its occupants into the Harz. In Harzungen the proportion of Roma and Sinti until the fall of 1944 rose at the workforce level to almost eleven percent. The main product of the Mittelbau-project was death. Among the murderous conditions, particularly on construction sites almost all the detainees suffered equally, whether they are Jews as well as Gypsies, who were under high pressure of annihilation anyway, or the French prisoners, who were ranked higher in the Nazi racial ideology. Thus, the adjusted death rates in the SS perspective of higher-value prisoner groups were those groups that stood at the bottom of the racial ladder. The consequence of this was that the death rate among the French and Belgian prisoners, especially many of whom were deported to the dreaded construction camp at Ellrich-Juliushütte, reached catastrophic proportions. In December 1944, nearly 40 percent of all deaths of concentration camp Mittelbau-Dora were non-Jewish French or Belgian inmates. The conditions at Ellrich-Juliushütte were utterly horrific, even by concentration camp standards. Due to the unusually high death rate, the authorities had a Krematoria built in February/March 1945. This brick structure, complete with dissection table, although only operational for several weeks, burned over 1,000 corpses. The ashes were dumped outside the Krematoria building. Twelve Wachturmen (watchtowers) guarded all sides of the camp, which measured several hundred metres at its widest point. The prisoners were housed in former factory buildings that were in poor condition. West of the Häftlingslager (prisoners' camp), the SS and Luftwaffe personnel who served as guards were accommodated, also in the former plaster factory buildings. Initially, the prisoner blocks had no bathroom or toilet facilities, with an external latrine pit in use until small external structures were used as sanitary blocks later. The prisoners had to wake at 3:30am, with a small dose of cold ersatz coffee substitute (without sugar) all they had before embarking on a three hour journey to the tunnel complexes where they worked. Following a twelve hour shift, with a brief pause for lunch which was generally a weak soup made from rotten turnips, the prisoners would begin the trek home. After arriving back at the camp some time between 10 and 11pm, they received a small piece of bread and margarine. Due to the severe food shortage, lack of water, poor clothing and chronic sleep deprivation, the death toll was catastrophic. Nevertheless, roll call had to be attended twice a day. Famine broke out in February 1945 after the bakery was destroyed. From then, clear soup was served twice daily. Throughout the duration of the camp, no prisoners took even a single shower, nor were they ever able to change their clothing. The question in this context is, the proportion of 'Night and Fog' prisoners (NN), in which quite a killing interest on the part of the SS may have to be accepted. Following an direction of the OKW chief Keitel of 7 December 1941, the resistance activity suspects from the occupied territories of Western Europe should not be sentenced in their countries of origin but to deter the population under complete isolation during (Nacht und Nebel) 'Night and Fog' brought cross the border to Germany. Since 1942, but especially in the last year of the war, almost all NN prisoners were transferred from prisons and from the SS special camp Hinzert into concentration camps. In all likelihood, a number of NN prisoners were deported to the concentration camp Mittelbau-Dora. This could possibly be the case of 1085 mostly French prisoners which arrived in September 1944 from Cochen, a sub-camp of Natzweiler who came under this category. 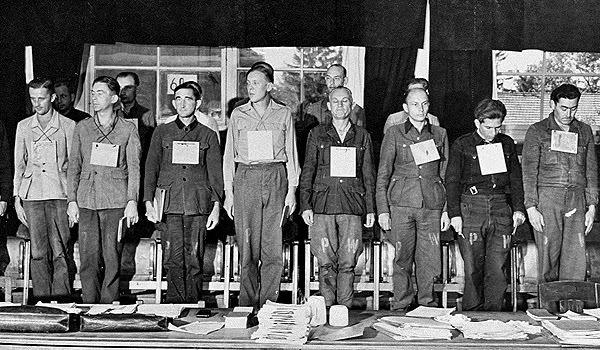 In contrast to other concentration camps, Mittelbau, however, was not explicitly identified as holding NN prisoners, neither were their clothes marked with the distinctive 'NN' nor do they show up in any strength lists. Thus, it is more likely that, because of their status they did suffer under a worse treatment in the Mittelbau-camps than other groups of prisoners. The many claims of the survivors put forward in reference to the NN status, therefore, seems to be hardly suitable to explain the high number of deaths among the West Europeans sufficiently enough in the Mittelbau-camps. Rather, it shows the attempt to rationalize their own suffering and deaths of the inmates later, at the thought to have suffered senseless, which often collides with the self-image of former prisoners. The camp SS and the guards in the concentration camp Mittelbau-Dora were, as in all other camps organizationally part of the Waffen-SS. The internal structure of the Camp Management with the task of work distribution among different departments did not differ from other internment camps. Commandant of Mittelbau until end of January 1945, who at the end of August 1943 was displaced from Buchenwald by SS-Sturmbannführer Otto Förschner, then relieved by SS-Sturmbannführer Richard Baer, ​​who had previously been commander of the now defunct concentration camp Auschwitz. As the protective custody camp and report leader and thus as an entity in charge of the inner camp operation acted in rapid succession several members of the SS who had been displaced from the concentration camps of Buchenwald and Sachsenhausen, and later mainly from the Auschwitz concentration camp into the Harz Mountains. The guards of Dora and the surrounding satellite camps were initially part of the SS guard company of Buchenwald. At least in the late summer of 1944, however, the increasing independence of the Mittelbau complex in the organizational consolidation in the southern Harz, all concentration camp guards were affected. With the issue of a special order dated 10 September 1944 the ​​Location Commander Förschner, ordered that the units of the SS-Building Brigades III and IV and Ellrich-Juliushütte including Harzungen would become part of the SS guard detachment of the Dora camp under SS-Hauptsturmführer Straupendahl. With this guard detachment at the end of October 1944 the official independence of this region the SS Totenkopf Sturmbann Unit Mittelbau was established, which was assigned to several Mittelbau complexes. With the expansion of the camp complex Mittelbau, members of the guards were constantly enlarged. In December 1943, the strength of the guards was 640 men. At the end of April 1944 it nearly stood at 1,000, including 15 SS officers. While the strength of the guards remained relatively constant in the main camp in the following months, and the number of prisoners increased only slightly, it shot up in the satellite camps rather sharply. At the end of 1944 the SS-Totenkopf Sturmbann-Unit had absorbed around 3,300 members of other incoming SS members. With the evacuation of the east-lying concentration camps came by the end of January 1945, many other stragglers of the SS arrived into the South of the Harz. Many of them were taken into the Mittelbau SS Totenkopf-Company for a spell. However, figures are no longer available, it can be assumed at a conservative estimate, that at the end of March 1945, there were at least 3,500 members (a motley assortment) of the SS absorbed into the guard contingent of Mittelbau, including about a dozen female guards,(Aufseherinnen) in addition to a few hundred members of the SS-Building-Brigade from Auschwitz were staying at the concentration camps in the southern Harz. The expansion of the recruitment field of concentration camp guards to the Wehrmacht in the last year of the war shows that the circle of those perpetrators and bystanders who were directly involved in the system of Nazi concentration camps during the war was constantly larger and by no means confined to the heart of the SS as it tried to tell in the post-war narratives. Many scientists, engineers and Armaments Production Manager of the middle strata saw to it that the operation of the camp worked smoothly. The Desk Job Managers were instrumental in the organization of forced labour in the concentration camp in the Armament Industry (Rüstungsindutrie). They also planned the realization of the numerous underground relocation projects and provided important preliminary work in building concentration camps. The founding of the “Geilenberg Staff” was followed in the summer of 1944 by further underground relocation projects for the petroleum industry. These projects created an enormous demand for labourers, met to some extent by concentration camp inmates, but also by foreign civilian workers recruited by force, prisoners of war and Germans subjected to compulsory work. In view of the imminent end of the war, hardly any of these projects were carried even close to completion, despite the ruthless exploitation of the labourers, particularly the concentration camp inmates. Most of the Mittelbau camps set up in connection with the underground relocation efforts were situated within a relatively small radius around Nordhausen. With the establishment of the sub-camps the concentration camp system from 1943 came more and more into the German civil society. This affected the whole Reich. In the Südharz the camp network was especially dense, with about 20 camps in the territory of the former county (Grafschaft) Hohenstein, transformed this region during the end of the war into a comprehensive concentration camp, which was interspersed with islands of civilian life. Mittelbau-Dora and the sight of concentration camp prisoners were part of the everyday life to the population. Points of contact between the camps and its environment resulted from the involvement of local authorities in the management and supply of certain requests by the Camp's Administration and it's resulting rampant black market, especially by the forced labourers of the concentration camp inmates inside the local re-located factories where the German permanent staff worked side by side with the prisoners. In the Mittelwerke plant at the end of 1944, 5,000 concentration camp prisoners worked alongside 3,000 German employees and workers. Most of them were German civilian workers, who oversaw the prisoner detachments at work. Some helped their prisoners, others were as far as brutality is concerned not any different from the SS, . Characteristic is a principal statement of the Board of the GmbH from the summer of 1944, which states: "In reports of the camp doctor at the Labour Camp Dora the finding was repeatedly made ​​that prisoners who are employed in offices or in the operation of the central plant had been beaten by [German] workers which shall on this account considered an offence, or they were even struck with sharp instruments ". Finally, points of contact were visually: The camps were often in the middle of villages. Who travelled around by train to the small town of Ellrich, saw at first the sub-camp Juliushütte: The camp was situated opposite the railway station, from its platform one could see quite clearly the smoking chimney of the crematorium which was only a few hundred meters away. In the near village of Niedersachsenwrfen everyone could observe the corpse carts that were included and pushed in the evening at the end of the columns of prisoners who were taken by their Guards from the construction sites at the Kohnstein back to the camp Harzungen. Civilian employees in the factories had to close ranks and watch, the same as prisoners, when inmates were hanged in public at their workplaces under accusation of sabotage, yet locals were involved in the hunt for escaped concentration camp prisoners. Although there was a certain amount of apprehension and unease under the civilian population when inmates had escaped. [In particular, the Country Guard (a paramilitary group of older men, commanded by the police) and the Hitler Youth were used. Especially the latter behaved according to reports from witnesses and survivors towards prisoners often extremely brutal sic]. (Dabei wurden vor allem die Landwache (eine paramilitärische Truppe aus älteren Männern, die von der Polizei befehligt wurde) und die Hitler Jugend eingesetzt. Vor allem letztere verhielt sich nach Berichten von Zeitzeugen und überlebendenn Häftlingen oftmals außerordentlich brutal). Although there were, from the German side the repeatedly mentioned myth of Brotzusteckens (giving of bread), according to reports of surviving prisoners. Certainly help and other needs was extended clandestinely towards prisoners. However, these were isolated cases and prove really just that there were alternatives. No one was forced to face inmates with hostilities, to beat or even kill them. However, widespread acceptance of the Mittelbau Complex shows up when looking at the situation in the southern Harz that the population accepted the existence of the camps in their midst, some of them of course with stolidity. This consent was caused by a mélange of various factors. Basically, no doubt, it was from the myth of obeying orders, the pervasive repression and thus at least the subjective feeling of being itself threatened by the Nazi terror. That left the unwillingness to rise and join. Important were also the traditional rejection of everything foreign and ideological indoctrination by the Nazis, which the media presented as concentration camp prisoners being supposedly dangerous felon, from whom the general public had to be protected. The result was that the prisoners were perceived by many locals as a threat and could hardly hope for much help by the population. In 'Südharzer Courier', the official party local newspaper, has been reported since the beginning of 1944 again on violent prisoners from the Mittelbau-camps that have escaped. Here, up to 5,000 RM award were offered for information or seizure of fugitives , according to today's valuation about 25,000 Euros, a sum which is offered at most in the search for top terrorist or serious criminals. The criminalization of concentration camp inmates from the fact that multiple prisoners,, who were alleged on the run from the concentration camp, committed murders of locals, one of the alleged crime scene, records show that in the middle of the village where the offence had taken place were publicly hanged, in autumn 1943 at Stolberg a the small village of Hermann's field, a few miles away from Nordhausen. [Report of the Attorney General Nordhausen, 10.1.1944, in: StA Gotha, page 175.sic]. To know and diffuse about the murders in the East was still relatively easy. The crimes in the Mittelbau happened but outside our own front door. Everyone could see, and many took part in it or benefited from it. The presence of the act did not result in the rejection of the regime, but rather identified of complicity by the action with the perpetrators, the receptive participation to contribute (Mitmachen) went frequently too far. A major cause of participatory willingness is likely the addition to the aforementioned reasons, deliberately stirred up by the Nazi propaganda of fear and the vengeance of the eventual victors, which gave the individual the feeling of being bound completely to the system and if necessary go down with it, if need be. The fomented fear of revenge (or punishment) of the winner and the Liberated tied the Nazi Propaganda seamlessly to their Manichean ordinal concept of understanding the concept of Order (Ordnungsbegriff) which had served since the early thirties to isolate Community Strangers (Gemeinschaftsfremde) and give a fellow-feeling (Volksgenossen) the material and emotional security he/she was striving for. The media packaging image making the statement of the murdering and plundering prisoners, and the alleged danger that seemed to emanate from the Mittelbau camps (which was a reality), although collided with the sense of security, however, and bound the population even closer to the system that the hazards that they had created was under control as promised. Another reason for the widespread adaptation and passivity was the years of getting used to the oppression and exclusion of Community Strangers, thereby prepared the ideological and emotional ground that the sight of the battered concentration camp prisoners was perceived by only a few as wrong because not much was left of any existing civilizational values. It certainly helped by the fact that the camps were, in the perception of many locals, kept in their memories as a war experience (Kriegserfahrung) and nothing else. After the liberation by the American occupation forces started the repatriation in collaboration with the United Nations Relief and Rehabilitation Administration (UNRRA). The Dora camp and Herzungen which was converted as accommodation for 'Displaced Persons' (DP's) for the liberated concentration camp prisoners and foreign forced labourers to return to their countries of origin. By Mid-May 1945 there were 14,000 DP's waiting alone in the camp Dora for their repatriation, most of them were former civilian forced labourers from the many sites of the Mittelbau Enterprise. The weakened concentration camp prisoners who were liberated by the Americans from the area of the camp Dora and from the Boelke barracks were taken under American supervision into makeshift hospitals in Ilfeld and also cared for in the nearby Spa Sülzhayn. Almost half of the 500 freed prisoners, however, were already so weakened that they did not survive the first weeks after liberation. Their bodies were buried along with the over 1,200 dead recovered from the sub-camp in the Boelke-barracks in a memorial cemetery in Nordhausen. The leading German rocket engineers around Wernher von Braun entered service for the Americans, while the Soviets claimed the next highest echelon. When the American military trial of former SS men and capos from Mittelbau-Dora Concentration Camp began in the summer of 1947, hardly anything remained of Camp Dora. After the last DPs had left Dora, it was used as a reception camp for German refugees and expellees until the autumn of 1946. The city of Nordhausen subsequently had the barracks taken down and reassembled in its destroyed districts for use as emergency accommodations. The grounds of the camp were reclaimed by nature. After Thuringia came under Soviet administration in July 1945, the Red Army continued operating Dora, now as a “repatriation camp” for former Polish and Soviet forced labourers. After the last remaining former forced labourers had left the camp, the East-German authorities used it from late 1945 to the autumn of 1946 as a refugee camp for German expellees from Czechoslovakia. The city and district of Nordhausen subsequently had the Camp Dora-barracks dismantled and erected elsewhere to serve as temporary lodgings for persons who had been bombed out of their homes. Also a part of the tunnel system disappeared. 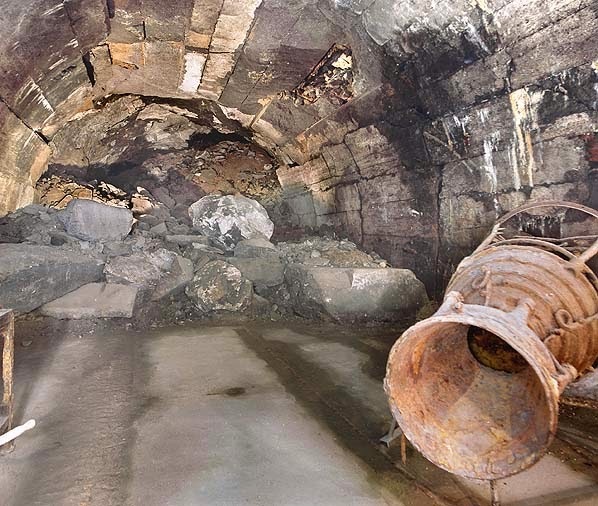 After a short period of continued use as rocket factory under Soviet leadership, the occupation authorities blow up parts of the tunnels, including the entrances in 1947. This followed an Allied Agreement which stipulated that military systems should be rendered unusable in Germany. At the other camp sites of the Mittelbau-complex was barely something to see of the past. In most cases, the barracks were dismantled as in the Dora-camp after the war and used as timber and firewood. Today only the concrete foundations bear witness of the past of these places. Other camps served as accommodation for refugees, such as in Stempeda and Blankenburg-Oesig. In Blankenburg the multiple converted barracks are still inhabited today. By the end of the 1940s, hardly anything remained to be seen of the former camps. The grounds had rapidly been reclaimed by nature. 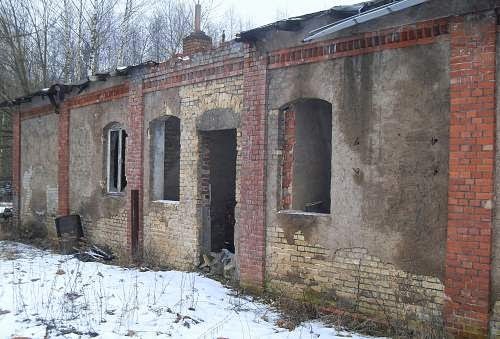 The only buildings left standing were the crematorium, the fire station and the camp prison in which hundreds of persons had been tortured and murdered in 1944/45. In 1952 the German Democratic Republican (GDR) authorities had the prison torn down against the protests of former inmates. At around the same time, a group of Nordhausen citizens – including Buchenwald survivor and later mayor Fritz Giessner – began landscaping the area around the former crematorium and the ash grave to serve as a cemetery and commemorative site. In 1964 the Socialist Unity Party (SED) district committee founded the “Mahn- und Gedenkstätte Dora” (Dora Memorial) and had a sculpture by the artist Jürgen von Woyski erected in front of the former crematorium. Woyski’s work had actually been conceived for the Auschwitz Memorial. Two years later the Dora Memorial went into operation with the opening of a permanent exhibition bearing the programmatic title “Die Blutspur führt nach Bonn" (The Trail of Blood Leads to Bonn) in the former crematorium. The Mittelbau-Dora Memorial never played a key role in the GDR commemoration policies. Unlike Buchenwald, Sachsenhausen and Ravensbrück, it was never granted the status of a “national memorial”. Mittelbau-Dora remained in the shadow of Buchenwald. The only major procedure which referred exclusively to crimes that had been committed in the concentration camp Mittelbau-Dora , was performed after preliminary investigations during the years from 1967 to 1970 before the District Court of Essen. Defendants were Helmut Bischoff (Defence Officer of the A 4 program and in 1945 commander of the Security Police Mittelbau, Ernst Sander (Head of the Gestapo branch Niedersachswerfen) and Erwin Busta (member of the SS in the camp Dora ). The case against the jurist Bischoff the chief of SD and Gestapo can be referred to in the area of ​​ concentration camp Mittelbau rightly regarded as one of the main perpetrators, was suspended a few days before pronouncement of judgment for alleged unfitness to stand trial and later set aside and not proceeded. Busta and Sander were indeed sentenced to relatively long terms of imprisonment, but never had to take it up. The resolution of Mittelbau began in late fall 1944. Due to the overcrowding of the satellite camps, but especially by the onset of winter. The living conditions in all camps of the concentration camp complex, which led to a sharp increase in the death rate and deteriorated further. While the figure of (750) deaths dropped to 100 to 150 a month after the peak in March 1944 until the summer of 1944, it increased again from November 1944 onwards sharply, reaching in December, the number of 570 officially registered by the SS as dead, of which nearly 500 alone in the camp of Ellrich-Juliushütte. With this high death rate the Boelke barracks which was de facto a pure death-camp. Among the prisoners it was feared as a "living crematorium", and as photos of emaciated corpses went around the world, when the camp was liberated by the Americans on April 11, the Boelke barracks it's name "Nordhausen concentration camp" became quickly an international notorious example of the crimes committed in the Nazi concentration camps. In fact a particular gruesome meaning finally came to this satellite camp , which was set up by the SS beginning January 1945 in the empty hangars on the site of the city on the south-eastern outskirts of Nordhausen, the Boelke barracks (Kaserne) in which, since the summer of 1944 with around 6,000 foreign workers of the North plant and several hundred inmates of a Gestapo detention camp were housed. Actually, this satellite camp had been provided as an accommodation for prisoner detail detachments, who had to work at Niedersachswerfen in over 20 different Nordhäuser companies during the construction of B 11 and were previously housed in the Dora camp. However, as from the end of January 1945 numerous transports with exhausted, sick and many already dead concentration camp inmates from the dissolved concentration camps Auschwitz and Gross-Rosen arrived in the South-Harz and simultaneously increased the overall sick numbers in the Mittelbau-camps drastically. The SS administration changed not only the terminology but their strategy of the central sick- and death camp of the Mittelbau complex. Ever since the arrival of more than 3,500 completely exhausted and sick prisoners from the concentration camp Gross-Rosen in mid-February 1945. Increasingly a large proportion of the inmates of the camp could no longer be used even by SS standards, in any work-assignments. Finally, the camp was the home to thousands of dying prisoners who were left on their own, on concrete floors of the vehicle halls, slowly vegetating, and then died daily by the dozens, even up to the end they perished by the hundreds. 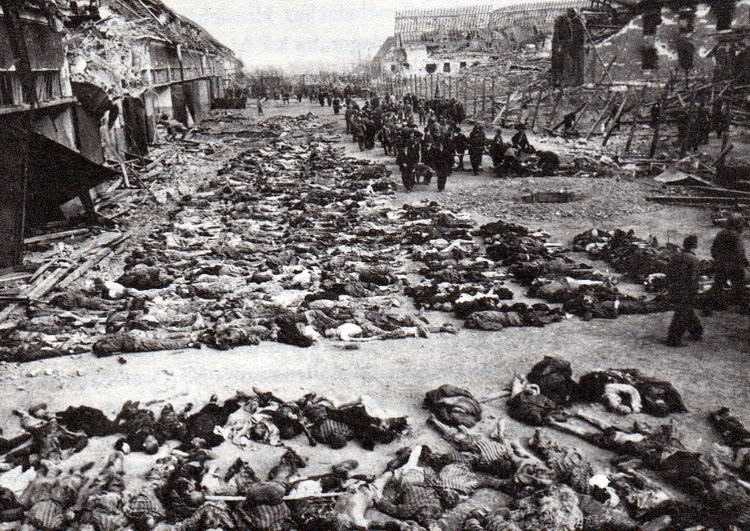 The total of dead in the camp, which existed for only three months, is estimated at about 3,000 people. In addition, other victims of the concentration sub-camp of the Boelke barracks have to be added around 2,250 sick and dying prisoners who were early in March 1945 transferred to the Bergen-Belsen and already on the way or soon after their arrival were either dead or dying. 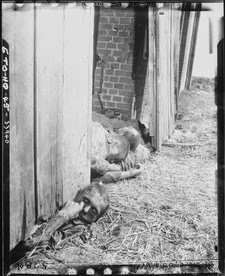 This picture was shown world-wide as to the atrocities committed by the Nazi-Regime, in reality the dead were the result of an Allied Bombing Raid at Nordhausen in particular the Boelke-Kaserne. Allied bombers attacked the city of Nordhausen in Germany on April 3, 1945. They also struck the Boelcke Barracks (Kaserne), a sub-camp of Dora-Mittelbau, although this was not the target of the attack. Almost 1,500 prisoners were killed in the attack, they were put on display for propaganda purposes after the liberation of the camp. (Most of them in a state of decomposing) The US weekly magazine Life (21/05/1945, page 36), comments: ‘The bodies of almost 3,000 slave labourers being buried by US soldiers. These dead, worked in underground factories in the manufacture of V1 and V2 rockets'. America's bombing involvement in the civilian bombing method was demonstrated in the following way: "In 1943, the theoretical became reality when the Chemical Warfare Corps built mock-up German and Japanese working-class neighbourhoods in the Utah desert. Exact replicas of the working class 'rent barracks' of Berlin's densely populated "Red" (Socialist and Communist) districts and the industrial towns of the Rhine were built. They were then bombed and studied in excruciating detail. Armed with the test results, including proof of the utility of the new anti-personal M-69 napalm ammunition, the Allies bombed into the rubble more 1920's socialist modernist utopia than Nazi villas.Yet the bombing of cities did NOT destroy Germans' will to fight, nor could the Allies continue the bombing raids indefinitely. The Czechoslovakian architect Antonin Raymond, who worked several years in Japan (including a stint in Frank Lloyd Wright’s office) developed the planning basis of the Japanese Village. The emigré Jewish architects Erich Mendelsohn and Konrad Wachsmann consulted on the planning of the German Village—Mendelsohn, well known for his buildings in Berlin, was excluded from the Prussian Art Academy in 1933 and emigrated first to London, later to Israel [Palestine] and, in 1941, to the United States; Wachsmann fled to France and reached the US shortly before the occupation with the help of Albert Einstein, where he joined Walter Gropius to work on the development of prefabrication systems. Several unnamed architects affiliated with the “Gropius Group” at Harvard also participated in the research studies on typical German city structures and building constructions that accompanied the planning of the German Village. At the end of 1944, the SS began, to "evacuate" the inmates of Auschwitz and Gross-Rosen from the advancing Red Army to further west located concentration camps. Many of these transports went to the concentration camp Mittelbau - a total of up to 16,000 prisoners from Auschwitz and Gross-Rosen, was until the beginning of March 1945 taken into the Harz facilities, including women and children. [End of January 1945 arrived in the camp Dora a transport with over 500 almost exclusively Jewish women from Auschwitz, most of which were passed two weeks later into the concentration camp Bergen-Belsen. Only 10 non-Jewish women remained in Dora and in all likelihood were forced there to work in the newly established prisoner brothel. Other transports with female prisoners arrived in early March from Bergen-Belsen into Dora (26 Jehovah's Witnesses) and mid-March 1945 from a satellite camp of KZ Groß-Rosen (285 Hungarian and Polish Jewesses ), Ref: Wagner, Production of Death,(Poduktion des Todes) page 414 -418. sic] The Mittelbau camp was in a sense the continuation of the concentration camp methods of Auschwitz. On the one hand, the SS in Nordhausen was the "Transfer location of KL Auschwitz", which had the task of clarifying the whereabouts of personnel and equipment of the SS commandant from their "old" camp. On the other hand, and this had a dramatic impact on the conditions of the existence of the Mittelbau-camps, came 1,000 SS men from there to the Harz. Members of the Auschwitz command staff took over in early February 1945, all the important posts at Mittelbau. The new commander and successor of SS-Sturmbannführer Otto Förschner, who had been transferred to the satellite camp Kaufering (a sub-camp of the Dachau), were the former commandant of the Auschwitz , SS-Sturmbannführer Richard Baer. ​​The all important positions in the administration of the concentration camp Mittelbau were replaced and occupied with "trusted"and familiar Auschwitz Personal and greatly contributed to the intensification of the SS Terror in the southern Harz. 'At the end of the war, Baer fled and lived near Hamburg as Karl Egon Neumann, a forestry worker. In the course of investigation in the Frankfurt Auschwitz Trials a warrant for his arrest was issued in October 1960 and his photograph was printed in newspapers. He was recognised by a co-worker and arrested in December 1960 after Adolf Eichmann's arrest. On the advice of his lawyer he refused to testify and died of a heart attack in pre-trial detention in 1963. The story of Baer's arrest is vividly recounted by Devin Pendas in his book The Frankfurt Auschwitz Trial. After seeing a wanted picture in the Bild-Zeitung, a co-worker on Otto von Bismarck's estate reported that Baer was working as a forester there. When officials confronted "Neumann" in the forest on the early morning of December 20, 1960, he at first denied everything. Having already addressed Baer as her "husband", the woman in the house subsequently gave her name as "Frau Baer", but still claimed that Baer was named Neumann. Baer, however, finally admitted his true identity'. With the transports from Auschwitz and Gross-Rosen, the number of Jewish prisoners increased in the Mittelbau camps. Most of them were sick and exhausted after weeks of rail transport, many did not survive the rigours. The result of this development was a new dramatic increase in the mortality rate. Between January and early April 1945 about 6,000 prisoners died in the Mittelbau camps, of which approximately 3,000 in the death blocks of the Boelke Barracks. The air attacks on Nordhausen did not solve the evacuation of the Mittelbau-camp, but accelerated it significantly. The evacuation of the main camp Dora began on the evening of the 5th of April, when 4,000 Soviet prisoners were taken by train to Bergen-Belsen. Around the 4 April the camp commanders of the other Mittelbau camps must have received orders to evacuate at the same time. Most camps were evacuated on 4 and 5 April 1945. This was a repeat in itself what the prisoners from Auschwitz and Gross-Rosen had to suffer in January and February 1945: In a hurry and with great brutality, the guards drove the inmates into freight and cattle wagons. Several trains loaded with thousands of prisoners left up to the 6 April 1945 the South Harz, to Bergen-Belsen, Sachsenhausen and Ravensbrück. In addition, many columns of exhausted prisoners, driven by the guards were dragged to walk through the Harz Mountains towards the north-east. Those who could not keep up with the forced marches, were shot by the guards were they had collapsed. In particular, in the area north of Magdeburg in mid April 1945 it came to repeated massacres of prisoners whose death marches were held up in the area. The brutal massacre committed by members of the SS, Wehrmacht soldiers and members of the Volkssturm and Hitler Youth on 13 April 1945 a few hours before the arrival of American soldiers in the Isenschnibbe barn at Gerdelegen was by any standards the worst ever.. The barn was set on fire and over 1,000 prisoners died in there , mainly inmates from the concentration camp Mittelbau and from Hanoverian sub-camp of the Neuengamme complex . 'On the night of 13 April 1945, after consulting with the local Nazi Party official Gerhard Thiele, the SS drove the prisoners out of the city and into an isolated barn on the Isenschnibbe estate. The SS then set light to the straw in the barn, which had been soaked with petrol. 1,016 prisoners burned to death, suffocated or were shot by the SS as they attempted to escape the flames. American troops reached Gardelegen on the evening of 14 April. They arranged for the victims of the massacre be interred properly in individual graves and ordered the residents of Gardelegen and the surrounding towns to bury the bodies. 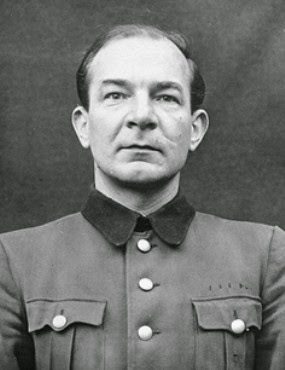 'The man who gave the order to burn the prisoners, Gerhard Thiele, escaped by disguising himself in the uniform of a German soldier and traveling with false papers. He lived in the Western zone of occupation and later in West Germany under a false name. He was never brought to justice and died June 30, 1994. SS-Untersturmführer Erhard Brauny, the transport leader for the prisoners evacuated from the Mittelbau-Dora concentration camp who subsequently wound up in Gardelegen, was put on trial in 1947 before a US military tribunal and was sentenced to life in prison. He died in 1950. More than half of the concentration camp evacuees from Mittelbau arrived in the concentration camp Bergen-Belsen. Due to overcrowding of the camp by Mittelbau prisoners, they were not housed in the actual concentration camp proper , but kept in the 'barracks camp' (Kasernenlager), which was only occupied by them until its liberation by British forces on 15/16 April 1945. Mittelbau relocated inmates were considered part of the concentration camp Bergen-Belsen, yet they still kept their own identity. The last officer in charge of the main camp Dora, SS First Lieutenant Franz Hößler, was still appointed commander of the barracks camp only a few days before the liberation of the concentration camp Belsen. Most of the camps Mittelbau were completely cleared. Only in the Dora main camp and in the Boelke barracks, the SS left several hundred sick and dying behind who were liberated on 11 April 1945 by soldiers of the U.S. Army. The limited information available also suggests that the occupied camps exclusively with Italian military internees were not cleared. These prisoners may have been liberated by the Americans after the escape of the guards. Crucial for the survival conditions of the prisoners in the Mittelbau-camps was the character of the work to which they were forced to perform. The hardest work had generally the prisoners to do in the construction commandos. Here the chances of survival were minimal. "Do not bother about the human victims. The work must take place, and in the shortest possible time", Kammler did instruct his subordinates in the Mittelbau Concentration Camp. With all haste the SS guide posts and the construction companies involved drove the inmates to work. Dates should be adhered to, the life and health of the prisoners did not count. Not only in the tunnels, but also on the construction sites in the open air, such as the construction of the Hel-metal-track, the hard work quickly led to full-exhausting prisoners. There were also long, to- and from- departure paths that often had to be overcome by walking, inadequate safety precautions, inadequate clothing and nutrition, lack of working equipment and not least the harassment and abuse by the SS, Kapos and civilian foremen. For the prisoners the commandos that were used in the development of underground factories, were the most dreaded. Again and again they were exposed to the pressure waves of blasts during tunnel driving without a adequate safety distance. They hovered constantly in danger of being injured or killed by falling rock masses. The dust in the tunnels sapped the body of the prisoners. But drinking water, which would have been rudimentary in an emergency, or could alleviate thirst was denied to them. [There is no reason given, why not] Many prisoners were suffering from lung diseases. Tuberculosis was among the most common causes of death. Most patients did not have the slightest chance of being cured, it was often enough that the smallest abrasions could be fatal to the lives of completely exhausted and emaciated prisoners . The inadequate clothing promoted the weakening process: The prisoners from other camps of Ellrich and Harzungen had to do heavy work (Schwerstarbeit) on the sharp and edgy underground in the tunnels partially barefoot. Tunnel - A One of the two parallel tunnels'. According to prisoner reports the work in the tunnels depended on the constitution of the individual and took about four weeks before complete exhaustion sat in. For the inmates, this meant having to try at all costs to avoid the work in the gallery and possibly get into 'better' commandos outside of the tunnel, even in the coveted Production or Storage-Economic commando. Whoever had connection within the infirmary, could try to find there a while of shelter and recover part of their health. The official 'conservation', however, presented no alternative, because, contrary to the euphemistic relationships they served less as recovery rather than the systematic starvation of the 'unemployable'. But for those prisoners who were on friendly relationships with Functionaries in the hospital grounds or in the working statistic, who had the means and classify a friend as a skilled worker and thus assign him to a Production Assembly Line was often still a risk of exposure. Otherwise it meant practically a death sentence without any contacts, and In their desperation, not a few prisoners saw as the only way out, to commit suicide, or they acquiesced hand injuries. Hardly any better than in the tunnel were the working conditions on construction sites in the open. 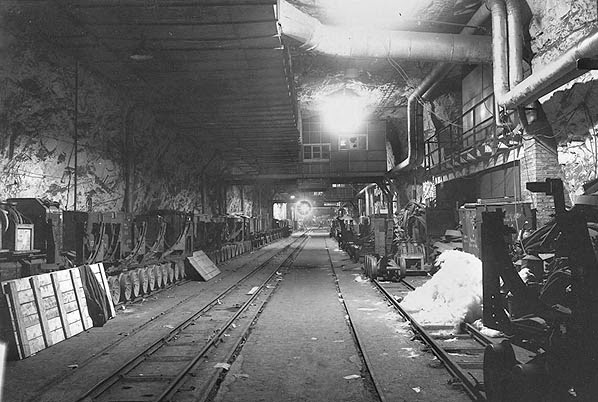 Although the prisoners did not have to contend there with the unbearable dust that prevailed in the tunnels, they were certainly exposed throughout the year to the weather. In the summer they had hot conditions, and in winter, when snow, cold and deep frozen ground made soil movement and lifting difficult, the construction work actually had often to stop. After the calculation of the SS corporate offices and profiting from the inmate work, private companies felt the 'construction prisoners ' were easily replaceable. Thus, one did not bother to preserve the health and lives of these prisoners, because 'replenishment' seemed to be there in sufficient numbers as a stand-by, especially after the evacuation transports from Auschwitz and Gross-Rosen arrived and many Mittelbau camps were always filled to capacity. Generally better than in the construction teams were the survival chances in the production commandos. At the start of the operation in production, it was often assessed by the reckless driving on the sites, and it's time-consuming training phase. This was especially true for the mustered prisoners as a skilled worker. To receive a minimum level of effectiveness of the work output the plant managers and the supervisory staff were instructed, to be more 'friendly' when dealing with the prisoners and their labour force. This not only meant a lessening of terror by the SS or Kapos and civilian supervisors, but among others, better clothes, more food and shorter marching routes. Besides that, the work itself did not tire prisoners in the production commandos to the same extent as on the building sites. To be assigned to a production commando meant first of all, to work in a relatively warm and dry place. Compared to a prisoner who had to carry in the cold, bricks or very heavy bags of cement, that alone was a major advantage. Besides the work on the machine which was physically usually less exhaustive, and as the production process was organized, for example in the Mittelbau factory, so that free German workers and prisoners worked together on the assembly lines, the prisoners could benefit from work breaks that were granted to the German civilian workers. The engagement of prisoners and paid civil labour went so far that even mixed efficiency groups of prisoners and civilian German workers were planned in the Mittelbau factory, which was a financial incentive scheme for both. (Arbeit nach Akkord). The general assembly process went as follows: First, the centre section of the rocket (the fuselage with its two huge alcohol and liquid oxygen tanks) was assembled. Next the propulsion group (combustion chamber, turbine pump, air bottles) was attached. Then the tail section of the rocket with its propulsion ring, rudder servos, and fins was attached to the motor. Finally, the guidance compartment (control amplifier, electrical distribution panel, main time switch, radio equipment, etc.) was attached to the front of the missile and the completed rocket went to Hall 41 for final testing and delivery to the launching batteries. Warheads were transported separately and attached to the rockets in the field. In particular, in the construction commandos prisoners were driven with blows which was part of the working day life. It was preferable not to be noticed, that was one of the most important rules for inmates who were able to aim for survival. Another was: work slowly. Both together meant possibly to pretend to be busy, when SS-men or civilian foremen looked around. But in spite of all precautions, the prisoner often failed to escape the arbitrary abuse by members of the SS or Kapos. Just exhausted and prisoners approaching death by their physical appearance were always victims of beatings and harassment. The gurds took every opportunity to exert their cruel preeminence determined to maintain the power of their authority. Under these described circumstances it was not to think of a normal work performance of inmates, either in production or on construction sites. Generally who was benefiting from forced labour were companies that had anticipated the fact that the prisoners would only be able to do half as much as German civilian employees. This under-performance was already included in the calculation of the daily fees as to inmate work-output. For skilled workers, the companies paid the SS, and thereby into the Reichs-Household Budget, as in other camps a daily wage of 6 RM. Labourers cost RM 4 a day, regardless of how long they had to work. If only for this reason, many companies had to base their daily shift on a 12-hour working day for prisoners. The long hours of arrival and departure routes to work areas and time-consuming roll-calls in the camps meant that the prisoners had little time to recover. 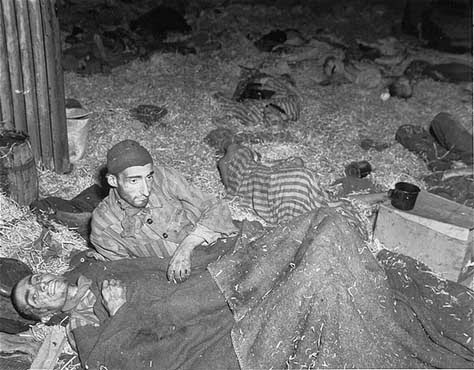 Even after scrutinizing SS data shows, the prisoners in the camp Ellrich-Juliushütte for example, had only 4.75 hours of sleep. Consequently, chronic sleep deprivation alone led to exhaustion. Various former factory structures were utilised by the SS, to hold the inmates at KZ-Aussenlager Ellrich-Juliushütte'. The long and often calculated decline of the prisoners labour in the perspective of the SS and their Advisory Staff, were fully aware that in the medium term, this was economically counter-productive - when finally, the workers who were urgently needed would die. The SS tried to overcome this dilemma to escape through a practice of mobile selections: the requirements of the SS-Advisory Board (Führungsstab) and the defence contractors accordingly met continuously to request new prisoners from other concentration camps into the Dora camp and were thence in a system of permanent selection depending on their physical condition and vocational qualifications and then have them distributed into the various Mittelbau camp complexes. Prisoners who were professionally qualified and physically fit, still seemed reasonably efficient, would remain in the main camp of Dora or were assigned to work details in the defence industry. In contrast, debilitated inmates had little chance to escape the transfer into one of the notorious construction camps, where the last bit of labour was beaten out of them. 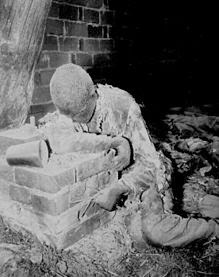 When they eventually were no longer able to work even by SS standards, they were deported to death zones - 'Protection-Blocks'- Schonungsblöcke) in the individual camps, or, from January 1945, in the northern houses of the Boelke Garrison (Kaserne). Most of the prisoners went through in this way on an ordeal, which led them from camp to camp, with ever shortening intervals, to the next one, and ended with death. This practice of mobile selection in a hierarchical camp system would allow the SS, and benefiting companies from inmate work to get the maximum performance for a minimum of support or care.. The best educated and technically qualified prisoners, primarily from Western Europe, were selected to serve on the missile assembly line, while the others were put on the harsher outdoor, transport, and construction commandos. The SS in Mittelbau-Dora had developed a system of “mobile selection,” where inmates who were worn out or less valuable were transferred to commandos, sub-camps, infirmaries or “death blocks” of increasing harshness, so that the weakest died off. Joachim Mrugowsky as a defendant in the Doctors' Trial. Dr. Mrugowsky, was a German hygienist. He was Associate Professor, Medical Doctorate, Chief of Hygiene Institute of the Waffen-SS, Senior Hygienist at the Reich, SS-Physician, SS and Waffen-SS Colonel, and defendant in the Doctors' Trial. He coordinated human experimentation at the Sachsenhausen concentration camp near Berlin. This included testing of biological warfare agents, including poisoned bullets. In 1940, as the troop physician of an SS "Das Reich" Division hospital company, Mrugowsky participated in the conquest of Western Europe. He was implicated in all medical experiments, with the exception of the aviation ones, which were conducted on concentration camp prisoners. 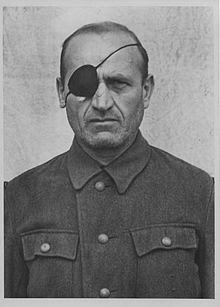 Mrugowsky was condemned to death in August 1947, and executed on June 2, 1948 at Landsberg am Lech. Most deaths in the concentration camp Mittelbau-Dora were a consequence of the murderous forced labour, insufficient hygienic conditions and inadequate nutrition. Especially towards the end but also many prisoners victims died from abuse and direct killings. An unknown number of detainees died after torture and interrogation at the detention cell building (bunker) of the Dora camp, whose outside court yard was set up as a place of execution, where the SS and Gestapo in secret executed prisoners, whose deaths obviously should not be known in the camp. The bunker courtyard was, were the two temporary communist camp elder George Thomas and Louis Symcak who had refused in the spring of 1944 to hang a Russian fellow prisoner, and immediately prior to the evacuation of the camp on 4 April 1945, together with five other German prominent political prisoners and a Russian, who had been part of the resistance group, were shot there by the Gestapo members. Also, the high-ranking Communist Party functionary and former member of the Prussian Landtag Albert Kuntz died in the bunker. After weeks of torture he was found strangled in his cell at the end of January 1945. And this is what happened at the hour of execution, silent and staring stood the prisoners from the respective Blocks. The camp commandant ordered the block elder to step forward. Georg Thomas, 37 years of age, a mechanic from Munich, member of the KPD (Communist Party of Germany) since 1929, had to take the decision of his life. In 1933, the Nazis had arrested and interned him in KZ Dachau. Later, he had in the meantime released in 1935, he was again detained and deported to Buchenwald. On August 28, 1943, he arrived in KZ Mittelbau-Dora as Block Elder I.
Georg Thomas stood in the front of the gallows. Behind him, he felt the gazes of thousands of comrades from France, Czechoslovakia, Germany, the Soviet Union[...] His voice loud and well audible, he called out: 'I refuse to obey this order'! Death silence. Nailed boots hurried across the roll square. 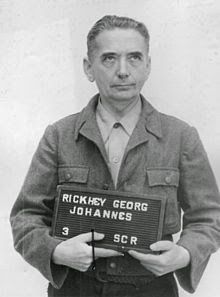 Georg Thomas was tied by the SS guards, who then escorted him to the bunker. Again the voice of the camp commandant: 'Block Elder II, come here'! Ludwig Sznczak, the mine-worker from Upper Silesia, came forward. His stare was firm. As a communist, he had lived in the Soviet Union before 1933, and had participated in the creation of the Soviet State. After his return to Germany, he had settled in Wuppertal. The Nazis, after they had sized power, had arrested the upright communist. He was in the function of Block Elder ever since he had arrived in Mittelbau-Dora. Ludwig Szimczak did not falter. His words resounded loudly over the square: 'I refuse to obey the order'! 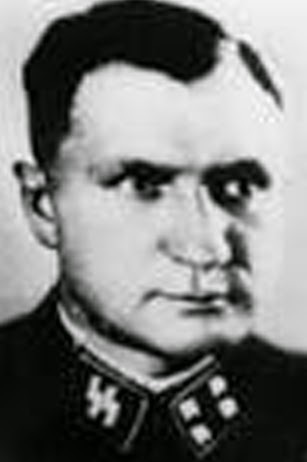 Two SS-guards stepped forward, tied Szimczak and brought him to the Bunker. Prior to the completion of the bunker, for secret executions the SS took advantage of a quarry below the crematorium. Here, the SS shot in mid-December 1943, just days after the inspection tour of Albert Speer, seven Italian soldiers who had refused, citing the Geneva Convention, to work in the defence industry. Approximately 60,000 prisoners were deported from August 1943 to March 1945 into the Mittelbau-Dora Camps. The total number of deaths can not be determined exactly. Approximately 12,000 deaths were recorded in the surviving SS files. In addition, there is an unknown number of unregistered deceased and killed prisoners, in the Mittelbau complex, plus 1,200 dead, who were recovered by the Americans from the Boelke barracks,[This is a disputed allegation.sic] about 5,000 dying after the extermination transports early 1944 were sent to Lublin and in March 1945, to Bergen-Belsen. In addition the number of prisoners who did not survive the death marches after the evacuation of the Mittelbau-Dora camps in April 1945. It can be assumed at a conservative estimate of at least 20,000 prisoners that were deported to the concentration camps to Mittelbau-Dora, and did not survive. About two-thirds of them died in the satellite-camps. The term "Mittelwerk" had been established in the early days and was familiar to most rocket program managers, long before the place was incorporated as a Limited Company (GmbH). Presumably it was intended from the beginning to organize the new company along commercial lines. The strings attached for the planned company formation was in the hands of Karl-Maria Hettlage, who was Head of the General Referat (Speaker) of Economy and Finance in the Ministry of Munitions. After several preliminary negotiations on the missile program, the participants met on September 21, 1943 in Hettlage's board room, based in Berlin for the founding meeting of the Mittelwerke GmbH. Present were, besides Hettlage, among others, Karl-Otto Saur, Walter Dornberger, Hans Kammler, Gerhard Degenkolb and his deputy as well as representatives of WIFO and the Reich-owned Armour Kontor GmbH (Trading House). 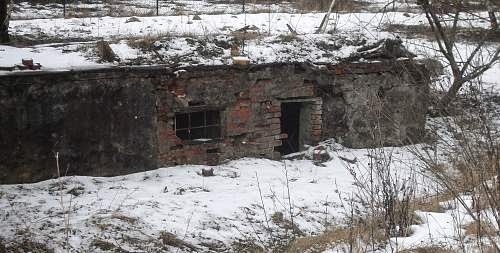 It was agreed to leave the reconstruction of the tunnel system to the missile factory of WIFO, who owned the tunnel system and should remain their property. The Raketenproduktion (Rocket-production) was transferred to the newly established 'Mittelwerk' GmbH, which was funded by the Armur Kontor GmbH and thus was a privately organized state operation. Up to this point, that the company was founded on this basis, was nothing special. Reich-owned (State-owned) arms factories were by no means rare. Unusable, however, was the decision that "a KZ-Administrator would be provided as an over-all operator [...]". It is quite obvious that the SS had enforced this recommendation, and it is no coincidence that the Advisory Board of the Mittelwerk GmbH next to Degenkolb, Hettlage, Dornberger, Kunze and the Amor Kontor boss Heinz Schmidt-Loßberg as well as SS Brigadefürer Kammler should belong to the board. Three days after the meeting, on 24 September 1943 the new company was officially established in the presence of a notary, and since October 7, 1943, it existed upon entry into the Berlin commercial register also de jure (by Law). Kurt Kettler took over the management as intended. As a second managing director was the commander of the satellite camp Dora, SS-Sturmbannführer Otto Förschner in October 1943, after the WVHA chief Oswald Pohl and Kammler had named him as the representative of the SS on the board of the Mittelwerk enterprise. The former professional soldier Förschner, born in 1902 in the Bavarian Dürrenzimmern was already in 1934 a member of the SS (Allgemeine SS) and took over after various assignments as an instructor in the Waffen-SS, the leadership in 1942 of the guards at the concentration camp Buchenwald, before he was transferred in September 1943 and became Kommandant of the newly founded camp at Dora. Officially Förschner was indeed a member of the management of the Mittelwerke, but his real job in the operation was not initially well defined, they could hardly have been, because the SS officer was neither trained, technically nor economically and thus for his new job anything but suitable . The title as a director was therefore purely formal in nature, and documented the claim of the SS participation in its administration of the company. The actual technical and commercial tasks were performed by director Kurt Kettler and the third Managing Director Otto Karl Bersch appointed in December 1943 . All three of them of them were sub-ordinated to the new member since April 1944, as Chairman of the Board Georg Rickhey, who came from the Demag-Vehicle Assembly Plant located at Berlin-Falkensee and appointed to this position at Nordhausen. He became head of Mittelwerk GmbH in Dora-Mittelbau from April 1944, overseeing production of the V-1 flying bomb and V-2 rocket. His work on these weapons saw him awarded the Knights Cross of the War Merit Cross along with Walter Dornberger and Wernher von Braun. Arrested in 1945, he was taken by the U.S. Army to live at Wright-Patterson Air Force Base, Ohio where he worked under the terms of Operation Paperclip. He was subsequently indicted as part of the Dachau Trials of 1947 under accusations that he had worked closely with the SS and Gestapo and witnessed executions. A lack of evidence however saw Rickhey acquitted. He did not return to his work in the United States. STRUCTURAL CHANGES: THE BEGINNING OF THE ROCKET ASSEMBLY AND THE RELOCATION OF PRISONERS INTO THE CAMP BARRACKS. The gradual inclusion of the rocket assembly began in the early 1944 at 'Dora' and with that a transition of structural changes began. Prisoners had previously been used primarily in the gruelling construction work that did not require special skills, the Mittelwerke needed now a trained workforce for the machines with highly qualified operators. 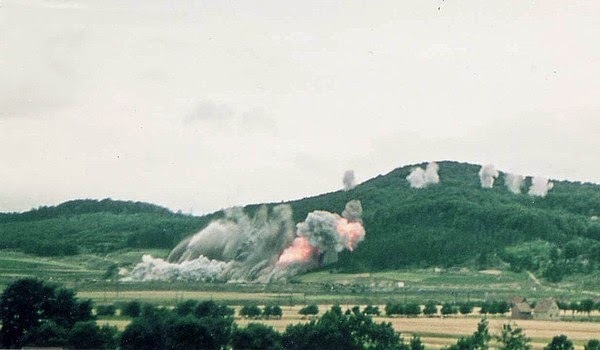 Unlike on the construction sites, the exploitation of labour of the prisoners were now subject to technical and economic limits in production of rockets. Just work on technically sensitive missile components required technical know-how, a highly and skilled workforce, and who was not a skilled worker, had to be trained usually over a longer period of time. Thus, it was in the interest of management of the Mittelwerke to ensure that the living conditions of prisoners had to be greatly improved and get their work force into such conditions that they were able to perform at least initially a required standard of workmanship in the assembly process. 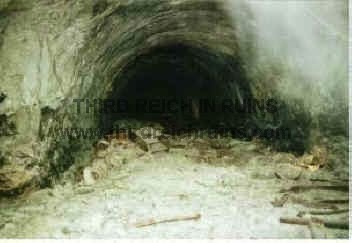 A major reason for the high levels of absenteeism and the huge death toll was in the disastrous sanitary conditions in the sleeping tunnels. The basic requirement for improving work performance, therefore, was the move into the above-ground barracks. After the Mittelwerke and the SS camp, from January 1944 was almost completed, the prisoner commando that was used in the construction of that camp, had been considerably enlarged. Gradually, what emerged were 18 wooden watchtowers surrounding the area with an electric fence in addition to some massive Administration Buildings, the crematorium and an equally massive detention cell building (bunker) and numerous barracks that served as logistic- and accommodation blocks. In late summer 1944, the camp had received largely its final appearance, although not until the last few days before the camp was disbanded in 1945 expansion work was still carried out in April. The entrance gate - which, incidentally, did not have the usual concentration camp slogans such as "Work makes you free" or "To Each His Own" - was located between two elongated administration barracks in which the SS administration and the camp Gestapo were housed. Behind it lay a vast parade ground which was surrounded with other administrative barracks and outbuildings. To the left of the parade ground - seen from the entrance gate - was a 'sports ground' and right next to that, the massive arrest cell construction. On the right side of the parade ground the Library. Since the beginning of 1945, a prisoners' brothel was located behind some accommodation barracks and a little further set back the prisoner hospital barracks and not far from here, the crematorium, which was built on top of a hill and went in the late summer of 1944 into operation after the bodies were originally taken first for cremation to Buchenwald, but this procedure was done now locally from April 1944 in a mobile crematorium near the laundry barrack. 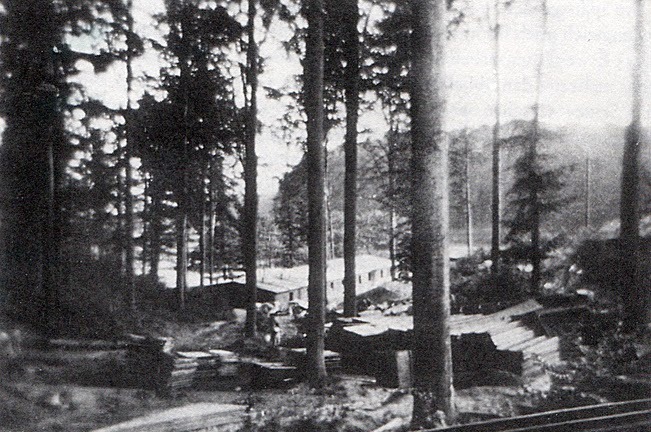 In the rear area of the camp was the majority of the 56 housing barracks, many of which were obscured by trees, because the SS left the surrounding trees standing to camouflage the area. As of December 1943 inmates were gradually transferred from the sleeping gallery into barracks which were under construction - at first mainly those prisoners who were not used in construction commandos, but the rocket production. The move into the barracks which stretched out until early June 1944. Some prisoners therefore had to spend up to nine months in the dark - if they survived such time. With the building of the above-ground camp, the living conditions for many prisoners improved significantly. The mere fact of being housed in a warm, dry and relatively clean place, meant a substantial improvement over the stuffy, damp and slippery with dirt of the sleeping gallery. In addition, there were in the barracks latrines and washing facilities, while the prisoners in the tunnel for months had not been able to wash themselves. At the same time the possibilities of medical treatment with the establishment of the infirmary were significantly expanded, catering has been improved and the prisoners employed in the missile assembly had to suffer no longer quite the harsh working conditions, thus since April 1944, the death rate fell significantly. However, the reduction in the death rate was not only a result of improved living conditions. First of all, it was due to the fact that all seriously ill and dying were summarily deported to Majdanek and Bergen-Belsen. There, the dying went on - so it was only outsourced. In addition, a large number of about 12,000 prisoners present during the summer of 1944 were not all exposed to the catastrophic phase of the winter 1943/44, and had thereby survived. Since the Mittelwerke required skilled and efficient manpower for the A4 assembly, it was through its engineers, who selected in all concentration camps new, and "unused" prisoners and deported them to Dora - even the director of the Peenemünde development work, Werner von Braun, mustered in August 1944 in Buchenwald concentration camp prisoners for missile assembly plant at Mittelwerk. (Although he denied ever been there, but there is evidence on record: 'Letter of Braun, to Sawatzki, dated 15.06.1944, in NASM, FE 694, (reprinted in facsimile. Eisfeld, Mondsüchtig, page 135f) The exhausted tunnellers, however, were deported from April 1944 into the newly created adjacent satellite camps where they were continued to be used as a construction workers. There was a distinct artificial drop in the death-rate, due to this move from the sleeping gallery into the above-ground barracks that included a gradual replacement of the exhausted against "fresh" detainees. The death rate would thereby in the Dora camp without improvement of living conditions, as not all inmates benefited from it, still higher then indicated, as the exhausted workers died in associated sub-camps. Between the main tunnels (A and B) every few yards were connecting galleries. These housed machine and sub-assembly shops and parts storage areas. 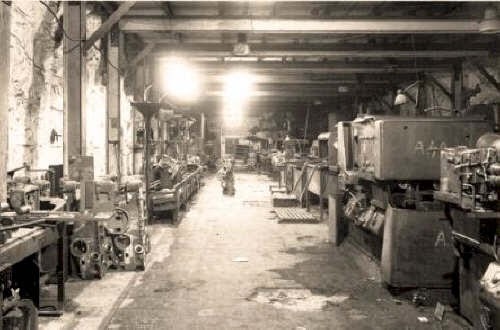 This gallery was one of the machine shops. Despite the numerous rendition of "fresh" and professionally qualified inmates, the rocket assembly plant in the Mittelwerke never ran according to plan. It soon turned out that the use of concentration camp prisoners in the complex missile assembly was limited, because they were slow and thereby worked over a longer, (time study) standard set period, and also after that, they had to be constantly monitored of their performance, since they did not voluntarily worked there for non-economic reasons, they had to be inspired and coerced to work. It did not go as smoothly as the representatives of the business and missile engineers in Nordhausen and Peenemünde had anticipated. A "building prisoner" who would go ahead with his shovel in his hand to do the tunnelling, the guards could literally exploit him with physical duress till he dropped. A "manufacturing prisoner"(Fertigungshäftling) who had to make the rocket filigree welding work was, however, not be moved to work by physical violence without further ado, management did not and could not jeopardize the product. Nevertheless, with specialized forced labour it was not possible without having permanent supervision and control, especially with prisoners who had to assume that the weapons they made by them put relatives at risk at home. 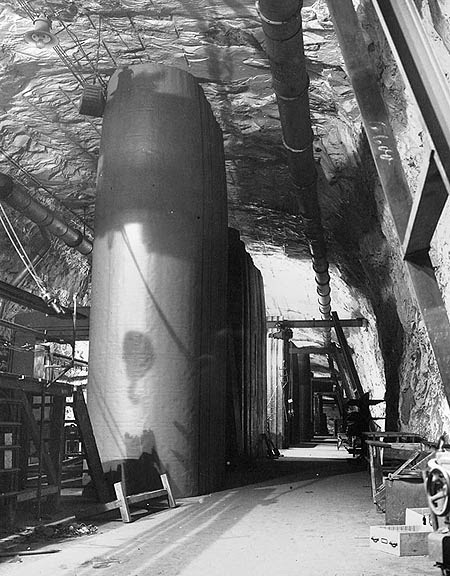 Two views of the workshop areas inside the tunnel systems while in use. Some of the tunnels were two stories in height, for larger machines. Considerable difficulties arose for the production process in the Mittelwerke by political and military decisions that were precipitated by Hitler, the top Wehrmacht hierarchy and in the defence ministry. At the direction of the Armaments Ministry, the Mittelwerke was forced in April 1944, to clear the northern half of its tunnel system in favour of the Junkers Group. This was code named "North Werk AG", and started in the summer of 1944 with the production of jet engines. As a result the Mittelwerk by moving within the tunnel system and the reduction of the production area by almost half had a dramatic drop in their own output: They assembled not more than 430 A4-rocket in May 1944, the production decreased further in June to 132 and in July 1944 only 86 missiles. And even if the monthly output levelled off during September 1944 to about 600 to 700 missiles, it was still a far cry from the 1,800 rockets that had been planned in October 1943 by the management of the Mittelwerke to be fully mounted on a monthly basis. Even the revised plan of November 1943, which provided for a monthly output of 900 pieces, could never be fulfilled. As to production inhibitory which turned out at the start of the rocket assembly, the fact that you had to struggle in the underground facilities despite elaborate supply of fresh air with dust and high humidity, the people and machines were always at risk. Management had to deal with replacement of resources, not only replacing the workforce, but deal with a host of other problems. In an internal report of May 1944, doctors indicated that a large number of sick German civilian workers - apart from the many thousands of mortally sick KZ prisoners were unfit to work in underground tunnels. The report it states clearly, there is no question about it. Around the same time a circulated memorandum noted of the condition that "the work in tunnels is a major health risk in the long run. The production in there will therefore probably need to be taken out in peacetime ". Compared to Hitler's demand of March 1944, "The final relocation of the entire German industry works will be under the earth". This was a significant downbeat assessment of the underground movement, to which in the last year of the war the hopes of the Nazi armaments planners, as for them it was a successful model project. Initial V-2s were plagued by bad welds, soldering problems, and faulty parts. At first electrical components were installed and final testing was performed at Degenkolb’s DEMAG facility at Berlin-Falkensee. 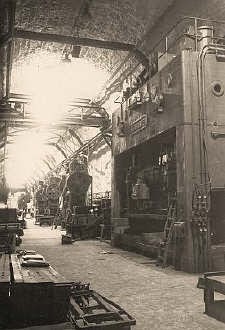 Later in 1944, these activities were moved to the Mittelwerk. Many prisoners involved in electrical assembly and testing were required to put slips of paper, bearing their unique identification numbers alongside of parts they had produced or certified. Then, if problems were found with these during later inspections, the workers responsible would be punished. Prisoners did in fact whenever possible urinate into the electrical wiring. Still, minor forms of passive sabotage could be accomplished by the prisoners for example by accepting for assembly subcontractor parts that they knew did not meet specifications. There were instances of prisoner workers knowingly passing along electronic sub-assemblies that contained “cold solder” connections—ones that were likely to produce intermittent or no electrical contact at all, and thus lead to failures. Other prisoners recount making partial arc welds in hidden locations on the rocket (for example, inner welds on fins that would hopefully come apart later under launch stresses). Sabotage was a dangerous undertaking, however. The penalty was death, and the SS guards often carried out individual or group hangings as an object lessons to the prisoners. The huge cranes in Hall 41 were used to hoist victims up by their necks and let them slowly strangle, in full view of the members of each of the Mittelwerk shifts, who were called to witness these hangings. The dead were then left to hang there, about five feet off the floor, for a day or so, while the prisoners came and went beneath them. A permanent gallows was later erected in the roll call yard at Dora. Mittelbau, also known as Dora, was the contraction for "Mitteldeutsche Baugesellschaft A.G.," the industrial complex that produced VI and V2 rockets. It consisted of three sub-camps: Mittelbau 1, the main camp, located near Nordhausen; Mittelbau 2, located near Ellrich; and Mittelbau 3, the smallest sub-camp, located near Harzungen. The Mittelbau camp notes are the most complex of all camp issues, because of the many series that were made. The notes range from .01 RM (which are easy to obtain today) to 10 RM denominations. The other denominations are extremely rare. There is no list of the complete nominal values issued. The notes were printed at the Buchdruckerei Theodore Müller in Nordhausen, Konugshof. 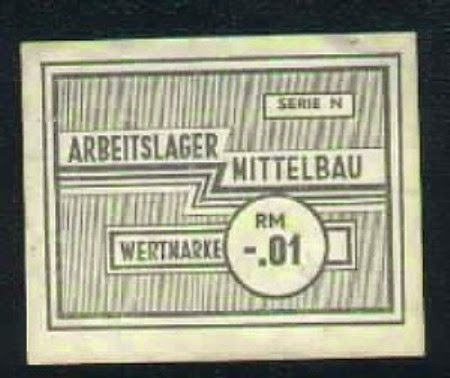 The printing orders for Mittelbau notes were destroyed by the Nazis before the liberation of the camp by the Russian Army in April 1945. Thus no documentary materials pertaining to the issuance of camp money at Mittelbau-Dora are extant. The legend printed on the reverse side of all the notes reads: "The safekeeping of funds for these vouchers is maintained by the Central Administration of the SS canteens in the Mittelbau area garrison. Counterfeiting will be dealt with in the most severe manner." Below the legend is a stylized six-pointed star and the serial number. The obverse wordings are always the same: "Work Camp Mittelbau. " The notes differ in colour, series, and denomination. All notes were printed on watermarked paper as a security device. Since the notes are similar in layout, their designs were probably created locally. LIVING CONDITIONS AND COPING STRATEGIES OF WOMEN IN CAMP BROTHELS. 'Now every night we had to let the men get on top of us for two hours. That meant they could come into the brothel barrack, had to go to the medical room to get an injection, could go to the number assigned - then the prisoners, could do their thing, come into the room, on top, down, out, back to the medical room, where they again got an injection. The prisoner had to leave the brothel after a fifteen minutes performance. We had a bathroom with a certain number of water closets. It did not lack cleanness there. And then right away there came the next one. Non-stop. And they didn't have more than a quarter of an hour.